One way to illustrate the trip characteristics of overloads in general and to show how SubMonitor is different is via a time trip curve. 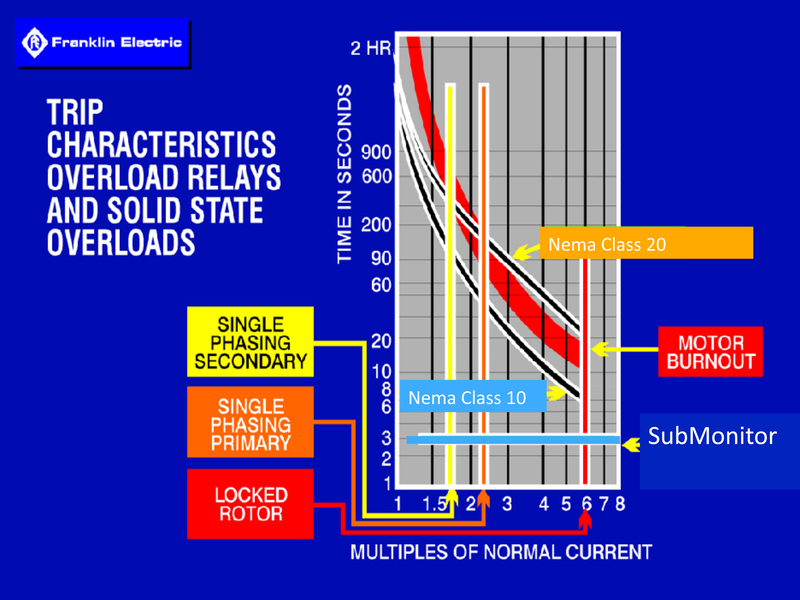 This curve provides a visual of the characteristics of overloads, the multiples of normal current needed to trip the overload, and the time in seconds it takes for the overload to trip at different amounts of excessive current. This is one of the places SubMonitor stands apart from other types of overloads. As you can see on the curve, other types of overloads trip at different times depending on the overload condition, whereas the SubMonitor always trips in less than three seconds. The faster a device trips, the more likely the motor will survive. One of the most important conditions that SubMonitor protects against is high and low voltage. All Franklin Electric submersible motors are designed to operate at plus or minus 10% of their nameplate voltage. If the voltage exceeds those limits, the motor can be damaged. 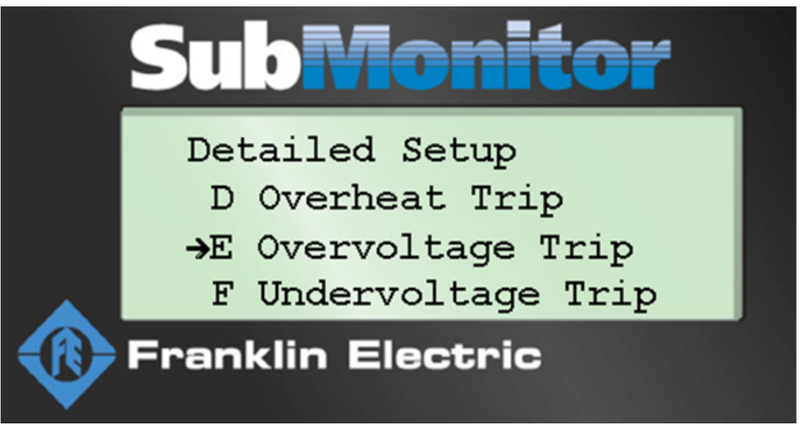 SubMonitor continuously monitors the voltage and takes the motor off-line if those limits are exceeded. So, in the case of a 460 V motor, SubMonitor will take the motor off-line within three seconds if the voltage drops below 414 V or exceeds 506 V. SubMonitor will keep the motor off-line for one minute, and then attempt a restart. If the voltage has returned to within 10% of nameplate, the motor is restarted. If not, SubMonitor will keep the motor off-line and attempt two more restarts. 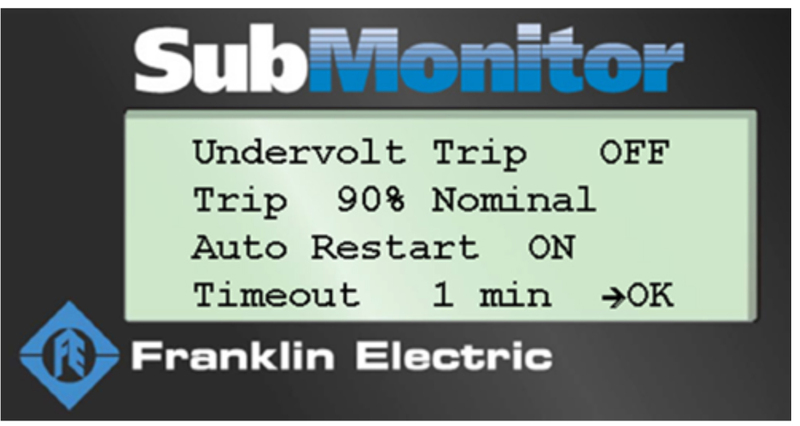 If after three attempts the voltage is still outside 10% of the nameplate voltage, SubMonitor will keep the motor off-line until it’s manually reset. It’s important to note that plus and minus 10% are the default settings. That is, no action is required to establish the settings above. However, when needed, SubMonitor offers a great deal of flexibility for custom installations. Using the “DETAILED SETUP” option, the undervoltage setting can be programmed from 80% to 90% of the nameplate voltage. The off time between attempted restarts can also be adjusted from 1 to 15 minutes. And the number of restart attempts can be adjusted from 0 to 10. In terms of overvoltage, the default setting of 110% can be overridden and adjusted to between 110% and 120% of nameplate voltage. Just like the undervoltage, the off time between restarts and the number of restarts allowed can be adjusted to between 1 to 15 minutes and from 0 to 10. As you can see, SubMonitor offers flexibility unavailable in other types of overloads. Using the default settings that are already in the unit, it can be a “plug and play” device or highly customized for a specific installation. We’ll touch more on these system abilities in our upcoming posts. If you have questions about protecting a system from adversity, our Technical Service Hotline is ready and available with information to help you in the field. Give them a call at 800.348.2420 or email hotline@fele.com.